This Saturday, I took a short road trip to Warrenton, OR, a small town on the coast immediately west of Astoria. Warrenton is situated on southern spit of the Columbia Bar, a set of sandy shoals at the often violent meeting of the Columbia and the North Pacific. And violent is the word: since the first crossing by a white guy 1792, some 2000 ships and 700 lives have been lost there. It is known as the “graveyard of the Pacific.” This was where the Coast Guard decided to put their Motor Lifeboat School, for the consistently difficult conditions. To become a Columbia River Bar Pilot, you must first have 15-25 years at sea, an unlimited tonnage master’s license, and be able to draw the nautical chart from memory. 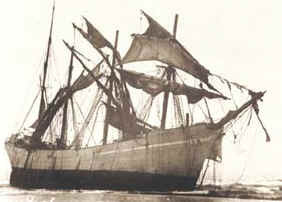 The Peter Iredale, shortly after she went aground in October 1906. I took a bunch of pictures. Click on the thumbnails below to view larger. All photos licensed under Creative Commons Attribution Non-Commercial Share-Alike. If you’d like a large one for your desktop, let me know and I can send it to you. This entry was posted in Uncategorized and tagged Columbia Bar, Columbia River, Graveyard of the Pacific, Peter Iredale, photos, pilots, PNW, shipwreck. Bookmark the permalink.